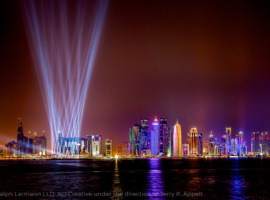 For celebrating the Doha National Day a magnificent light show should be realized. al Day 2013. 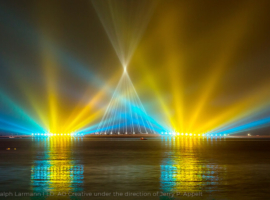 The location of the installation for the National Day illumination was Old Palm Trees Island, which lies some 800 metres from the corniche lining Doha Bay in the Persian Gulf. This was the first time fireworks and moving searchlights had been installed in this rather cramped location and it required AO Lighting working closely with the pyrotechnicians. “AO Lighting is now excellently placed in terms of ideas and expertise to participate in shaping the future of the lighting sector,” says Marco Niedermeier. 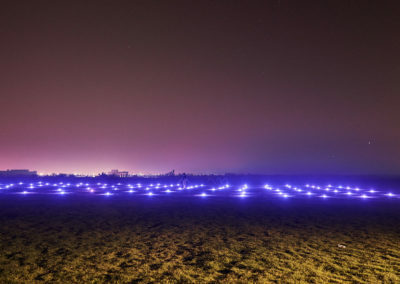 The highlight of the show was the first use of the ‘Double Twister’ composed of 7,000W searchlights flanked by fans of light spread by FALCON 6000 CMY searchlights. 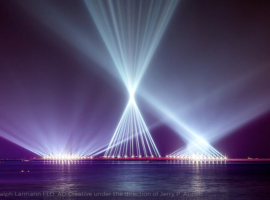 This architecture of light, formed by column-like beams, had already in a simpler form enthused onlookers in Azerbaijan and Muscat. 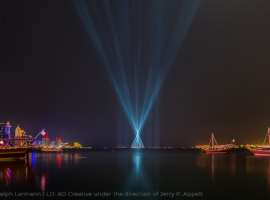 For this event, AO Lighting installed FALCON BEAM colour 7,000W and FALCON 6000 CMY fixtures on the small island – a logistical challenge in itself as all the equipment had to be transported there by ship. 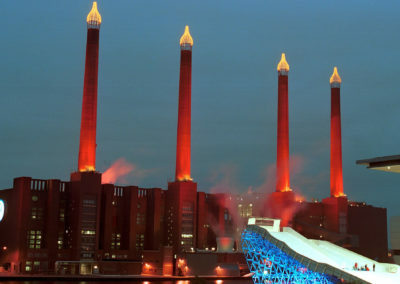 In the end, AO Creative, the in-house creative department of AO Lighting, realized a light show that could be seen from 360° and began as an ambient show four days before the actual event. 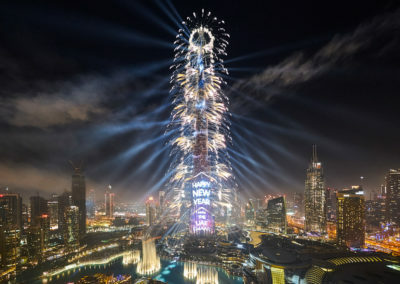 Every evening, from 7 pm to midnight, this ambient show became more elaborate, until guests and onlookers on the big day, 18 December, were able to witness the spectacle in its consummate splendour. 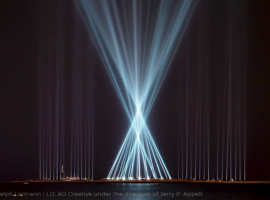 AO Lighting in the role of general contractor, along with its in-house creative department under the leadership of the lighting designer Jerry P. Appelt, was able to close out the year 2013 in style and hit the ground running in 2014.